We describe the design, implementation, and performance of a new parallel sparse Cholesky factorization code. The code uses a supernodal multifrontal factorization strategy. Operations on small dense submatrices are performed using new dense-matrix subroutines that are part of the code, although the code can also use the blas and lapack. The new code is recursive at both the sparse and the dense levels, it uses a novel recursive data layout for dense submatrices, and it is parallelized using Cilk, an extension of C specifically designed to parallelize recursive codes. We demonstrate that the new code performs well and scales well on SMP’s. This research was supported in part by an IBM Faculty Partnership Award, by grants 572/00 and 9060/99 from the Israel Science Foundation (founded by the Israel Academy of Sciences and Humanities), and by a VATAT graduate fellowship. Compaq. Compaq extended math library (CXML). Software and documuntation available online from http://www.compaq.com/math/,2001. IBM. Engineering and scientific subroutine library (SCSL). Software and documuntation available online from http://www-1.ibm.com/servers/eservers/pseries/ software/sp/essl.html,2001. Intel. Math kernel library (MKL). Software and documuntation available online from http://www.intel.com/software/products/mkl/,2001. SGI. Scientific computing software library (SCSL). Software and documuntation available online from from http://www.sgi.com/software/scsl.html, 1993-2001. Supercomputing Technologies Group, MIT Laboratory for Computer Science, Cambridge, MA. Cilk-5.3 Reference Manual, June 2000. Available online at http://supertech.lcs.mit.edu/cilk. R. C. Whaley and J. J. Dongarra. Automatically tuned linear algebra software. 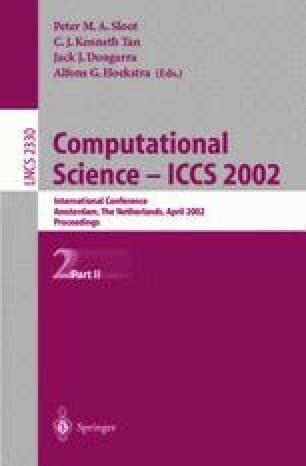 Technical report, Computer Science Department, University Of Tennessee, 1998. available online at http://www.netlib.org/atlas.